Hip Hop is art and with that meaning comes the three components of that art. In no particular order there is break dancing (or pop locking), mcing and graffiti. Graffiti derived from an Italian word "graphein" meaning drawing made on a surface has been part of our lives since Ancient times and is a form of expression much like break dancing and mcing. No longer has it been scorned as an act of vandalism, it's now considered an art form. Graffiti art is not easy to define in two sentences. "Graffiti is...it isn't" says documentary film maker Bob Bryan. "Graffiti is a many splendid thing and it means something to everybody. I think Graffiti art comes form a subculture phenomenon. It comes from the personality of the practitioner, the history and it comes from a popular culture that consists of Hispanics, Asians and African Americans." His critically praised documentary GRAFFITI VERITE' (Bryan World Productions) showcases the talent and art form of graffiti art. In the video Bryan was able to interview graffiti artists and show different graffiti methods from paint brush to aerosol cans. The most interesting artistic expression comes from one artist who hand carved, brushed and spray painted graffiti art on a Redwood (That was a Hispanic piece of a combination of old school ancestral hieroglyphics and styles mixed in one piece," he explains. The most significant aspect of the video is it, underlining message-Graffiti art transcends through cultures and countries. "I structured the video to educate people in the life as we11 as people who are outside of the life." he says. "It was the first opportunity to let people know that graffiti art is more than just tagging." Currently he is filming GRAFFITI VERITE 2 (GV2). GV2 will feature more international aspect of graffiti art. In connection with the new video, Bob Bryan will have an INTERNATIONAL GRAFFITI ART COMPETITION, Contestants from all over the world can send in detailed graffiti art drawings in any medium (canvas, video, etc.) AII the winners from the competition will be featured in the documentary which will also detail @ INTERNATIONAL GRAFFITI ART MOVEMENT. 'It seems to me that the periodicals [that print graffiti art] are preaching to the band. They are like talking to each other and it doesn't communicate we11 to the people outside of the movement" he says. "So it becomes a closed culture and therefore communication is not taken place. There is no real attempt to communicate well to people outside the movement and I think that is a flaw. 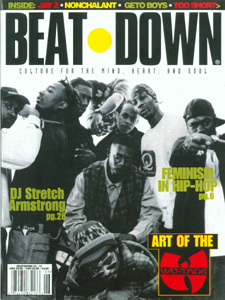 I challenge the periodicals [who print graffiti art] to communicate to people outside the movement." Ultimately, Bob Bryan wants graffiti Art to be legal so art can be expressed Freely. There have been harsh penalties created for graffiti writers, (or urban literature writers) who have been caught in their expression of art and fines are not even being considered. In L.A. any graffiti writer who is caught their art on walls or on any surface can get sentenced for 25 years. Bob Bryan, as well as others are currently trying to eradicate those penalties and to showcase graffiti art in galleries and museums for education and appreciation purposes. What is in the future for graffiti art? "Graffiti art can move along with everybody else in the 21st century and in the new millennium." he says. "I think the practitioners of graffiti art will evolve and always express how we live and how we appreciate the aesthetic. We have to open ourselves up to understand that it will change and that it will represent where we come from and what we're doing. For the future of graffiti art I say, 'just let it be.' Don't try to define it and limit it's growth. Graffiti art represents Freedom."